November 1, 2015 November 1, 2015 Lisa A. 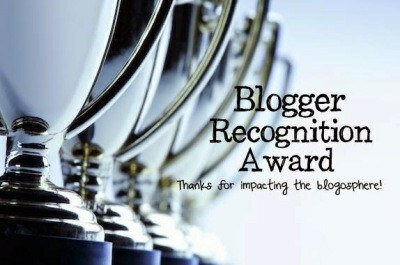 Thank you to Purple Slobin Recovery for awarding me the Blogger Recognition Award! Since I’ve been nominated for the award before, I used my previous answers because they haven’t changed. Do some digging if you must! Find those blogs. You cannot nominate yourself or the person who has nominated you. Write a post to show off your award! Give a brief story of how your blog got started, and give a piece or two of advice to new bloggers. Thank whoever nominated you, and provide a link to their blog. I’ve mentioned it before in previous posts and I will mention it again. I’ve been writing stories since I was 6 years old. I won an award for a story I wrote in first grade. Since then, I’ve enjoyed writing stories and poetry. I don’t really write poetry anymore. I like writing about current events, other people’s stories and whatever is on my mind. I took a five-year break from writing in 2010. My friend Ryan asked if I would help him write in his blog and e-zine and I said yes! I then decided to start my own blog. I’ve worked as a reporter and freelance writer for many years throughout my life. I plan on writing fiction books and stories in the future. I am also looking for freelance writing opportunities. Be yourself whenever you are writing. You might think it sounds ridiculous or weird but I can guarantee someone out there will like it. Don’t be afraid of rejection either. Keep writing during good or bad times! Writing will always be there for you. I consider writing my true friend and passion. People have come and gone from my life but writing will never leave me or my soul. I will continue to be loyal to it. It is so hard to choose just 15 blogs from an endless list of talented, funny, special writers on this platform! But I have chosen this 15, this time round… If you are not one to accept awards, that is not a problem, just think of this as a little nudge from me to you and all my Peeps, to read, follow, and recognize you too, as I have! No Pressure to Perform! Honest! Work is crazy right now. Lots of changes. Anyway, I have a couple of posts this week. Thank you Lynn 🙂 Sorry I didn’t respond earlier, life is kind of hectic over here. I hope you’re doing well! Congratulations on your award and thank-you so much for thinking of me!!! It was most kind of you!!!! Congratulations, your blog is wonderful! You’re welcome 🙂 Thank you for your comment! I understand about the whole awards thing! I love your advice about blogging!! That kind of encouragement is always needed when blogging!! And thank you so much for the nomination, especially considering I’m a new follower! I appreciate your thoughtfulness. I need to take a break from awards though…there’s just sooo many of them! !